Two miles east of Downtown Dallas, Fair Park is perhaps Dallas’ most important public asset. The 277-acre park includes the Cotton Bowl, several museums, a first-class lagoon, and the largest collection of Art Deco exposition buildings in the world. While the Park serves nearly 2.5 million visitors during the 3-week State Fair of Texas, it is underutilized the rest of the year, and offers few daily activities for the surrounding communities. Fences, large parking lots, oversized surrounding streets, and various other barriers limit neighbors’ access to the park, and three of the four adjacent neighborhoods suffer from some of the highest poverty rates in the city. The City’s plans to privatize the park have been deeply controversial. There is a broad public perception that the plans do not respond adequately to public feedback and the needs of the community. At Earth Day 2016, the Reimagine Fair Park booth attracted and interacted with thousands of visitors. The booth included an information area, a children’s section, large boards covering the past, present and future of Fair Park; and a discussion area with opportunities to write and draw visions of the park. ASH+LIME led the event and coordinated a group of approximately 20 volunteers. Over 900 ideas for the future of Fair Park were collected from the general public throughout the duration of the event. Volunteers engaged with children, teenagers, and adults alike to solicit ideas. 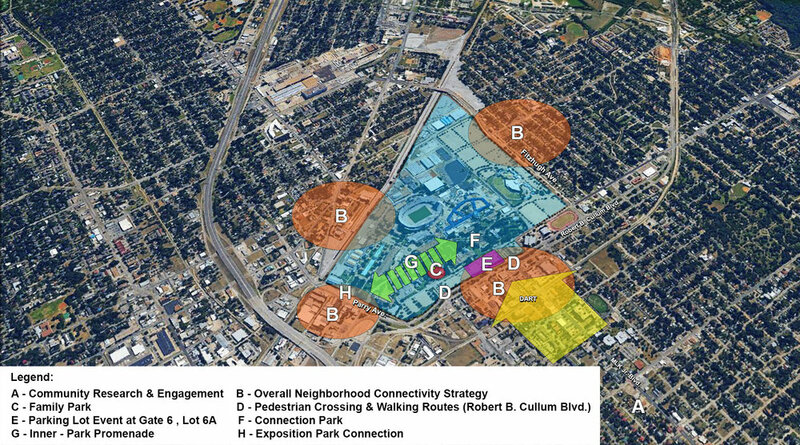 Additionally, ASH+LIME led several walking tours of Fair Park and the surrounding neighborhoods that were designed to provide a deeper understanding of the neighborhood and park dynamics. Our team incorporated feedback we gained from other events (Nearly 1,000 in total) to create a report with programming recommendations and proposed designs. This innovative outreach strategy illustrates how the firm’s tailored approach can engage the public in a more meaningful, inclusive, and engaging way, to inform the planning process.